Named after a Iowa World War II veteran and National Baseball Hall of Famer, presentation of the first-ever Bob Feller Act of Valor Awards scheduled to take place Nov. 6, 2013 from 6 to 9 p.m. at the United States Naval Memorial, 701 Pennsylvania Avenue, Washington D.C.
Born 1918 in Van Meter, Iowa, Bob Feller bypassed the minor leagues and pitched for the Cleveland Indians from 1936-1941 and 1945-1956. His professional nicknames include "Bullet Bob" and "The Heater from Van Meter." Feller enlisted after the Japanese attack on Pearl Harbor in 1941, despite having the option of a draft deferment. During World War II, he served four years on the U.S.S. Alabama, and ended his military career as a chief petty officer. According to press materials, when asked what the most important game he ever won was, Feller replied, "World War II." The award is to be given annually to one Major League Baseball player, one Baseball Hall of Famer, and—in the first crossover award of its kind between Major League Baseball and the U.S. Navy—one serving naval chief petty officer. 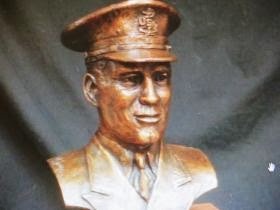 The physical award is a bronze bust of Bob Feller in naval uniform. Awardees are selected on criteria include the display of good character, assisting those less fortunate, supporting the United States and its servicemen and women, and good moral conduct. U.S. Navy Chief Petty Officer Garth Sinclar, 45, a chief hospital corpsman and instructor at the Naval Diving and Salvage Training Center in Panama City, Fla.
Justin Verlander, 30, pitcher for the Detroit Tigers and founder of Verlander's Victory for Veterans Foundation. Due to health-related travel restrictions, Baseball Hall of Famer Yogi Berra, 88, was presented with the third of this year's inaugural awards in a private ceremony Oct. 19 at the Yogi Berra Museum at Montclair State University, Little Falls, N.J.
An Oct. 16 Iowa Public Radio report regarding the Bob Feller Act of Valor Award can be found here. The website for the Bob Feller Museum in Van Meter, Iowa can be found here.